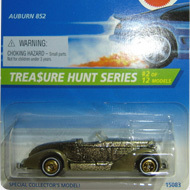 1/12 from the 1996 Treasure Hunt series. The Woodie has yellow paint and a yellow Hot Wheels logo on the side windows. It has tinted windows, a black interior, an unpainted Malaysia base, and yellow line Real Rider wheels with yellow or gold rims. 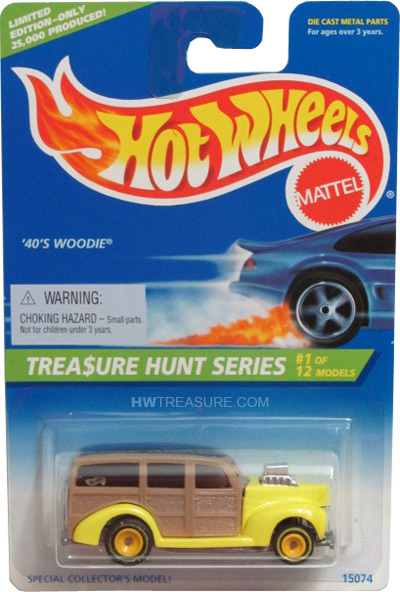 The ’40’s Woodie made its debut in 1980 in the Hi-Rakers series and is based upon the actual vehicle. It is not the only Woodie T-Hunt. In 2009, the ’37 Ford also became a T-Hunt.